It’s finally here! Dreamforce kicks off this week with thousands of B2B marketing professionals descending upon San Francisco for the cloud marketing event of the year. 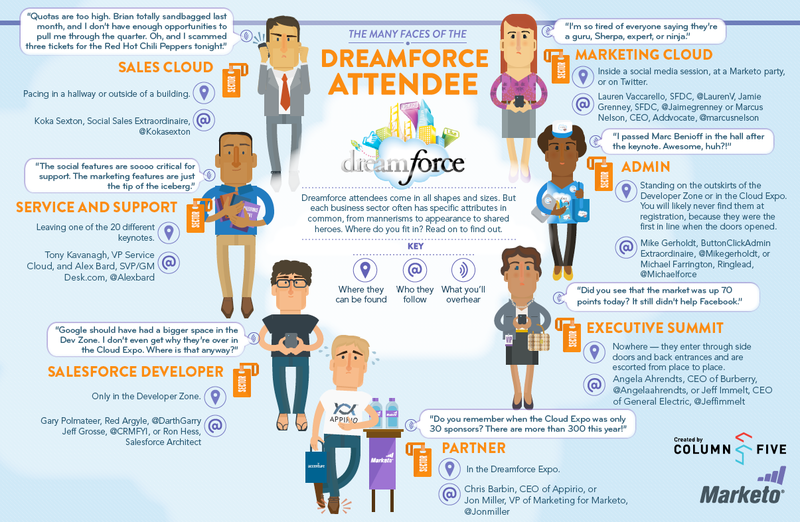 The infographic below is a fun look at the many personas of a Dreamforce attendee—from the corner office to the IT department—and the specific attributes they likely share. From mannerisms to appearance to shared heroes, check out the graphic below to see where you fit in. These folks and many more will be out and about in between the 750 plus sessions including Marketo’s individual sessions. If you like the nightlife, and like to boogie, don’t forget to sign up for a chance to attend our exclusive Speakeasy VIP party happening on Thursday night. So get ready to have some fun, meet new people, and experience Dreamforce 2012. See you at Moscone! Click to view the full-sized infographic, or use the code below to embed it on your own website. Enjoy!